2018/19 AW Green Shield Champions Northern District. Photo Ian Bird Photography. 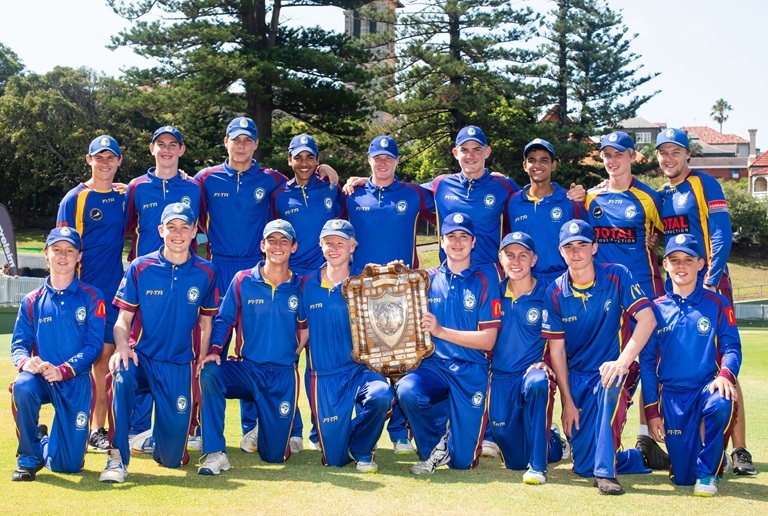 Northern District has emphatically upset minor premiers, Manly-Warringah, in the final of the Under 16 AW Green Shield at Manly Oval on Monday. After a clinical bowling performance saw the previously undefeated Manly-Warringah dismissed for 116 within 46 overs, Northern District won by nine wickets. The champions achieved victory in the 36th over and finished 1/117. Opening batsman William Coffey was awarded the Kevin Cunningham Medal as Player of the Final for his composed 53 from 94 balls that included six boundaries. Coffey and Corey Miller (40 not out) shared an opening stand of 102 to all but guarantee the 2018/19 Green Shield title for Northern District. It is the first time since 1978/79 that Northern District has claimed the Green Shield. The victory also marks the fifth time the club has won the Under 16 competition. Consistent wickets were the key for Northern District with the ball. Manly-Warringah could not put together a substantial partnership to give its innings the impetus it required. Jayden Camp returned best figures for Northern District. He collected 3-27 from his 10 overs. Every bowler used by Northern District captain Mitchell Crayn claimed at least one wicket. Varun Ravindran (2-16) and Spencer White (2-23) joined Camp as the other multiple wicket takers. Manly-Warringah captain Joel Davies completed the competition as the leading run-scorer with an outstanding 501 runs to his name at an average of 62.63. Northern District spinner Yash Patel was the leading wicket taker. He claimed 21 wickets at 11.1.